The 44 km course starts at Baw Baw Village and follows the Village and Summit Trails to Five Ways. From there it follows the Village Trail to McMillan Trail before rejoining the Village Trail to go past Baragwanath Flat to the track junction leading into the national park. From the junction the track heads up to join the Australian Alpine Walking Track before going south to The Camp. From The Camp, the run heads out to Mt Erica and Erica carpark before returning to The Camp. From The Camp you head out to Mt St Gwinear and Gwinear car park before returning to The Camp and heading back along the AAWT to rejoin the Village Trail. 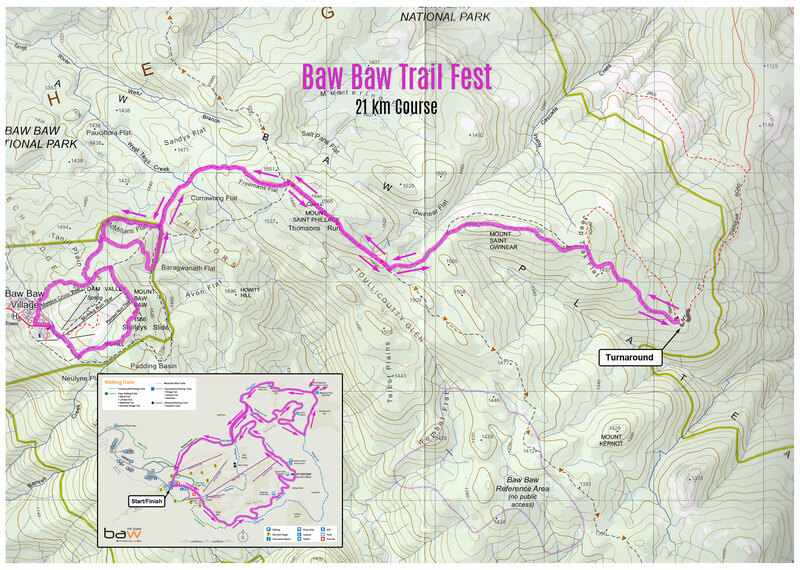 At the Baw Baw Resort boundary, head west along Village Trail to 5 Ways and descend back to the village along Muellers Track. The 36 km course starts at Baw Baw Village and follows the Village and Summit Trails to Five Ways. From there it follows the Village Trail to McMillan Trail before rejoining the Village Trail to go past Baragwanath Flat to the track junction leading into the national park. From the junction the track heads up to join the Australian Alpine Walking Track before going south to The Camp. From The Camp, the run heads out to Mt Erica and Erica carpark before returning to The Camp and heading back along the AAWT to rejoin the Village Trail. The 21 km course now starts at Baw Baw Village and follows a course along Village and Summit Trails to Five Ways, from there it follows the Village Trail to McMillan Trail before rejoining the Village Trail to go past Baragwanath Flat to the track junction leading into the national park. From the junction the track heads up to join the Australian Alpine Walking Track before going south to The Camp and then on to Gwinear car park. The return takes you back over Mt St Gwinear to The Camp and heading back along the AAWT to rejoin the Village Trail. 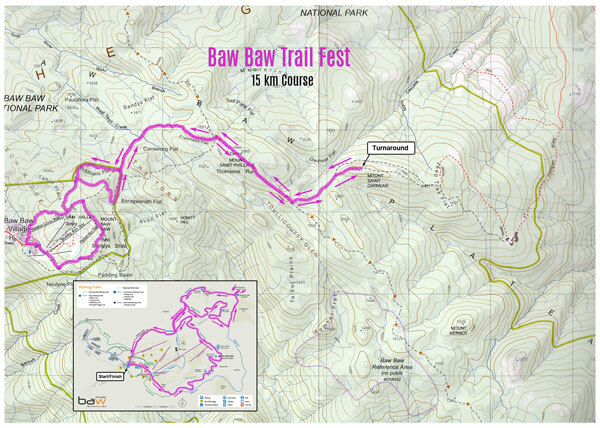 The 15 km course starts at Baw Baw Village and follows a course along Village and Summit Trails to Five Ways. From there it follows the Village Trail to McMillan Trail before rejoining the Village Trail to go past Baragwanath Flat to the track junction leading into the national park. From the junction the track heads up to join the Australian Alpine Walking Track before going south to The Camp and on to St Gwinear Saddle. The return takes you back to The Camp and along the AAWT to rejoin the Village Trail. 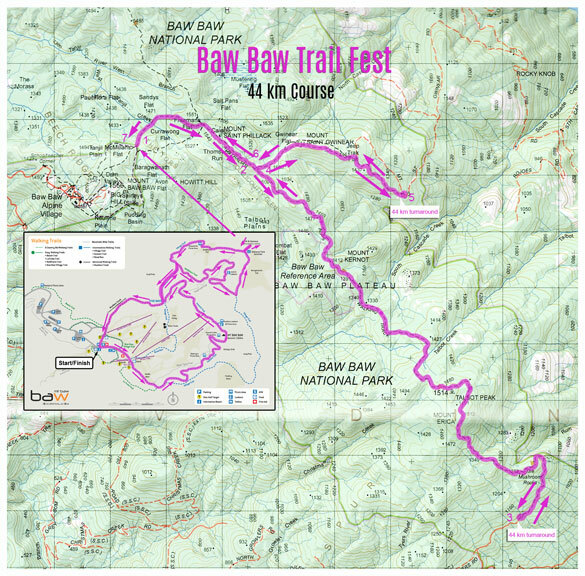 The 7 km course starts at Baw Baw Village and follows a course along Village and Summit Trails to Five Ways. From there it follows the Village Trail to McMillan Trail before rejoining the Village Trail to go past Baragwanath Flat. Continue along along Village Trail to 5 Ways and descend back to the village along Muellers Track. This is a marked course on Mount Baw Baw Village local trails.